Unfortunately, our copy is incomplete. The first section (總卷) and pp.1-92 of the second section (內卷) are missing. We know that these two missing sections were contained in a single volume, because the three volumes we have are inscribed “2. Volume”, “3. Volume”, “4. Volume”, together with a description in French of their contents. I don’t yet know the ultimate provenance of these volumes, and can only be sure that they were in Oxford by the last quarter of the 19th century. It is possible that they are from the Chinese works once in the possession of Golius. The French inscriptions are of the 18th or possibly even the late 17th century. I think there is a good chance that the first volume might be in another European collection; my initial thought was the Bibliothèque Nationale, but it doesn’t appear to be in Courant’s catalogue. 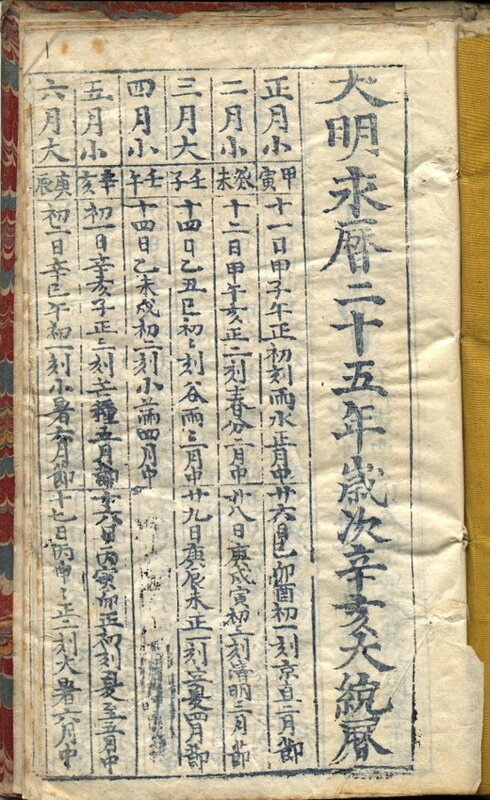 A complete copy of the edition (in the library of Peking Normal University 北京师范大学) is reproduced in the series Siku jinhuishu congkan 四庫禁燬書叢刊 (史部, 18), where it is described as 明末朗潤堂刻本, apparently only because the words 朗潤堂藏板 appear on the title-page 封面 – they don’t seem to appear anywhere else. Comparison shows that this copy and the Bodleian’s are taken from identical blocks. We are therefore concerned with the same edition, and can take the evidences present in the Peking Normal University edition as applying to our copy, too, even if ours lacks them. It is a geographical work, dealing with topography, administrative divisions, border regions, local produce and customs, towns and cities, famous places, and famous people. The complete edition is illustrated with 66 maps distributed throughout its text, and the maps of smaller areas are drawn to scale on a square grid. It is one of the earliest works of its kind. Its final section (外卷, 182-210, present in the Bodleian copy) is concerned with the siyi 四夷, the barbarians which surrounded China on all four sides. These included the Manchus, for which reason the book was banned during the Qing Dynasty, when unflattering reference to the Manchus was a very common reason why books were ordered to be burnt either in their entirety (quanhui 全毀) or in part (chouhui 抽毀). The book is therefore a little rare, with perhaps 20 copies or so being extant, and its importance caused Peng Dejing 彭德经 to publish an article on it almost thirty years ago, with the particular aim of establishing its precise date: 《地图综要》版刻考 in 江西师院学报(哲学社会科学版), 1983:3, 58-60, 90. The only evidences in the edition itself (apart from the geographical text) are as follows, in order of their appearance: 朗潤堂藏板 (title-page); 黃兆文刻 (preface p.1, 版心下); and 乙酉 (date of Li Ruchun’s 李茹春 preface, and the only date found in the edition). In printed and online catalogues, I have found over a dozen ways in which the date is expressed, from simply “Ming” 明 (in the National Library of China online catalogue) to “beginning of the Qing” 淸初 (in the Japanese online union catalogue of old Chinese books 全國漢籍データベース). Several say “end of the Ming” 明末 or “the Chongzhen 崇禎 period”. Some give a precise date using that of Li Ruchun’s preface, a cyclical expression equivalent to the western year 1645 which is translated variously into the second year of Shunzhi 順治二年, the first year of Hongguang 弘光元年 (the first Southern Ming reign period), or curiously “the 18th year of Chongzhen” 崇禎十八年 (in the Japanese online union catalogue, referring to copies in Tokyo University and the National Diet Library); there was no such year: the Chongzhen emperor hanged himself on Jingshan in the 17th year of his reign (on 25 April 1644) rather than face capture and execution by the rebel forces of Li Zicheng 李自成, who was on the point of taking Peking. Almost certainly these are all the same edition in a dozen different guises, and probably the only edition of this work before modern times, although naturally this is subject to confirmation by comparison. In my catalogue, I have decided to describe it as quoted above (南明乙酉序刊本) on the basis of Peng’s reasoning, which may be summarised as follows. As Li Ruchun was a juren 舉人 of 1627 and a jinshi 進士 of 1637, the year yiyou 乙酉 of his preface must be 1645. Although this is indeed the second year of Shunzhi, the first reign-period of the Qing Dynasty, both the work and its preface are wholly a product of the Ming: the term huangming 皇明 could not have been used in a text of the Qing, and the territorial extent of the work represents the Ming Dynasty at the height of its expansion. Most interestingly, the preface refers to the cataclysmic events which took place only months before it was written, when the non-Chinese invaders began to thoroughly overturn the old order; and Peng interprets some words of Wu Xueyan 吳學儼 (one of the compilers) in the fanli 凡例 section as suggesting that the work might have been produced as an appeal for help in achieving national salvation. It would have been published in the area around Nanking under the first of the Southern Ming kingdoms, established by the Prince of Fu 福王, Zhu Yousong 朱由崧, who ascended the throne on 19 June 1644. His reign-period was known as Hongguang 弘光, and was reckoned from the first day of the lunar year following his accession, 28 January 1645, the year yiyou 乙酉. The Qing forces took Nanking on 8 June 1645, less than six months into this period, and captured the fleeing emperor on 15 June. The text is simple enough: twenty poems by the Emperor Gaozong (the Qianlong Emperor, who reigned 1736-1796) in the calligraphy of the scholar-official Liu Lun (1711-1773). It is an exquisite product of the imperial workshop, and a is a so-called “sleeve edition”, that is, a volume small enough to be carried in the sleeve of a gown. 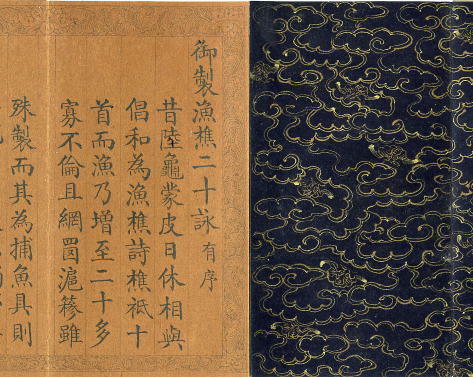 Its endpapers are decorated with cloud-patterns in gold dust, and with boards of jade, engraved with the title and authorship details. The binding is in what is often described as the “accordion” format, as its pleats resemble those of the bellows of that instrument. I dislike this vulgar term, and prefer to use either the Chinese term zhezhuang 折裝 (which simply means “fold binding”), or its alternative fanjiazhuang 梵夾裝 (“Buddhist scripture binding”) as this binding structure was and still is used for Buddhist sutras, and by extension, for Daoist scriptures too. We have no other example of a jade-bound book, which is probably a good thing, as the jade covers are so heavy, and the “fold binding” so difficult to handle, that if dropped, the covers would surely rip themselves off. When read, this book should therefore be placed on a table, and never opened in one’s hands. But I’m more interested in the provenance of the book than the object itself, although that said, I know of no other example of its kind in a European collection. Backhouse was one of the Library’s greatest benefactors. He presented his magnificent collection of Chinese books to the Library in stages between 1913 and 1922. At the time of the donation they constituted what was probably the finest collection of Chinese books outside the Far East, and the collection still contains many editions unique in the west. The jade book is among them. Unfortunately, we do not know the provenance of the 650 or so editions in the Backhouse Collection. Many of them bear seals, some of them from aristocratic owners. He may have bought them in the Liulichang in Peking, or through private connections at a time of dynastic change when fortunes were being lost and heritages scattered. Only one edition in the collection bears a label which records details of its purchase and the price paid for it. I thought more may be found in Backhouse’s memoirs, so set about reading them. They are introduced in Hugh Trevor-Roper’s A hidden life : the enigma of Sir Edmund Backhouse, which was published by Macmillan in 1976, the year in which I joined the Library. There are two sets of these memoirs: The dead past, and Décadence mandchoue. Both are highly pornographic, the first dealing with Backhouse’s experiences in an English public school and Oxford, involving Paul Verlaine among others; and the second set in high circles in Peking, where his encounters involved no less a figure than the Empress Dowager Cixi. Understanding these memoirs involves (in the words of David Rutherford, the Library’s first fund-raiser) “a qualification in anatomy”. I used to entertain the fantasy of publishing them, but could never find a way of extracting them from our Western Manuscripts department for long enough to photocopy them secretly; when their publication became known, I wanted everyone to know who was reponsible, but without being able to prove it. The time for such childish behaviour has now passed, because the Chinese memoirs were published openly last year, with all due consents from both the Library and the Backhouse family, by Earnshaw Books in Hong Kong: Décadence mandchoue : the China memoirs of Sir Edmund Trelawny Backhouse, edited and introduced by Derek Sandhaus. 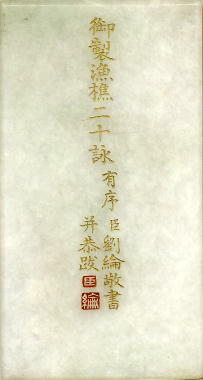 “The Grand Secretary had already hinted – and I did not wish to outstay my welcome – that it was time to take leave, and thanking Junglu for his exceeding kindness I was about to depart; but he stopped me to present a poem by Grand Secretary Liu Lun 劉綸 written for the Ch’ien Lung Emperor and bound in jade covers. It is now in a European library.” (p.58). There is no way of knowing if this is indeed the true provenance of the jade book, or even if Backhouse’s audience with Ronglu is the record of a historic event or a product of his fertile imagination. Opinions vary as to the historical worth of his memoirs. I have heard Xiang Si 向斯 (a research librarian at the National Palace Museum in Peking) say that the knowledge Backhouse displays of Palace affairs could only have come from an insider; but equally Craig Clunas has dismissed the memoirs as a farrago of absurdities, written at a time when everything within the Palace walls had become common knowledge. To me, Backhouse’s account of the origin of the jade book seems too straightforward to have been made up: it is insufficiently outrageous. And I much prefer Derek Sandhaus’s thoughtful treatment of the memoirs to Trevor-Roper’s “mean-spirited and narrow-minded” account of them. There is also a pleasing symmetry about the gift. Liu Lun and Ronglu both occupied the same office of Grand Secretary – in effective charge of the Chinese government – one fairly early in the dynasty, the other at the end; and both were renowned calligraphers. At this year’s EASL conference in Prague in early September, amongst the interminable talk of e-resources and the disappearance of budgets, it was a pleasure and a surprise to hear Marc Winter (from the Ostasiatisches Seminar in Zürich) give a succinct presentation on the background of the sibu 四部classification system. At one time, this would have been the common knowledge of anyone who studied China. Now, it is almost esoteric. When the web interface to my pre-modern catalogue is up and running, everything it contains will be accessible through a search 檢索 mechanism. But the whole will be presented in conspectus by an arrangement very similar to the browse 瀏覽 mechanism found in the International Union Catalogue of Chinese Rare Books 中华古籍善本国际联合书目系统 recently mounted by the National Library of China (this data is actually derived from Soeren Edgren’s Chinese Rare Books Project). 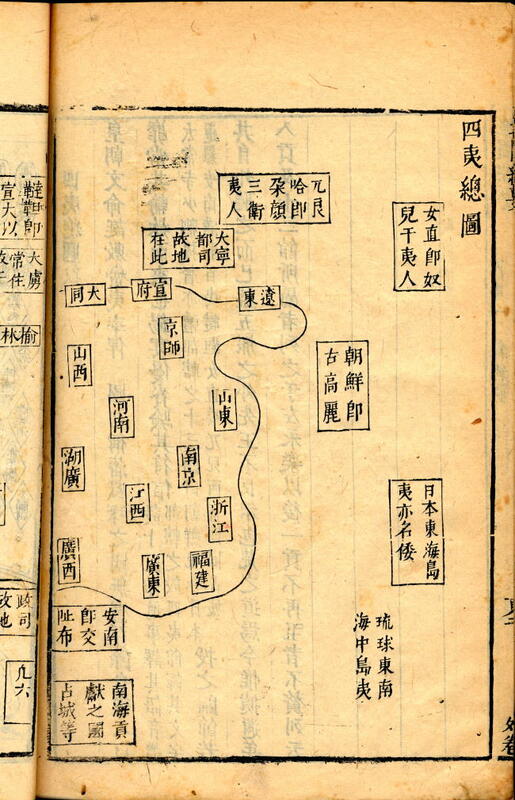 Here, as in all catalogues of pre-modern Chinese books, whether electronic or printed, the data is presented and made comprehensible through sibu classification, a knowledge of which is indispensable to anyone who studies Chinese bibliography. Inspired and informed by Marc’s timely presentation, I will first document the main stages in the development of the system. In a second posting I will deal with modern uses of the system, and how it may be adapted to embrace materials for which it was not originally designed. In 26 BC, Emperor Cheng of the Han Dynasty 漢成帝 ordered the scholar Liu Xiang 劉向 to organise the imperial book collection and produce a summary catalogue of it. The catalogue was called Bielu 別錄 (the term bie 別 is taken to mean that the works were separated out into different categories – or classified, as we would now say), and consisted of 20 juan 卷. Liu Xiang died in 8 BC, and the Emperor Ai 哀帝 ordered his son Liu Xin 劉欣 to take over his father’s job as imperial librarian. Liu Xin moved all the books into a new library called the Tianluge 天祿閣, and summarised and re-shaped his father’s work into what is now regarded as the first classified Chinese book catalogue, the Qilue 七略 (“seven summaries”), which was presented to the throne in 6 BC. In the preface to his Taoist books in the libraries of the Sung period (London, 1984), Piet van der Loon takes the completion of the Qilue as the beginning of Chinese bibliography. Both the Bielu and the Qilue were lost at the end of the Tang Dynasty, but the Qilue had been used by Ban Gu 班固 to compile the bibliographical treatise of the Hanshu 漢書藝文志 (漢書, 卷30), which was completed by his younger sister Ban Zhao 班昭 in AD 111, so both its arrangement and contents are preserved. 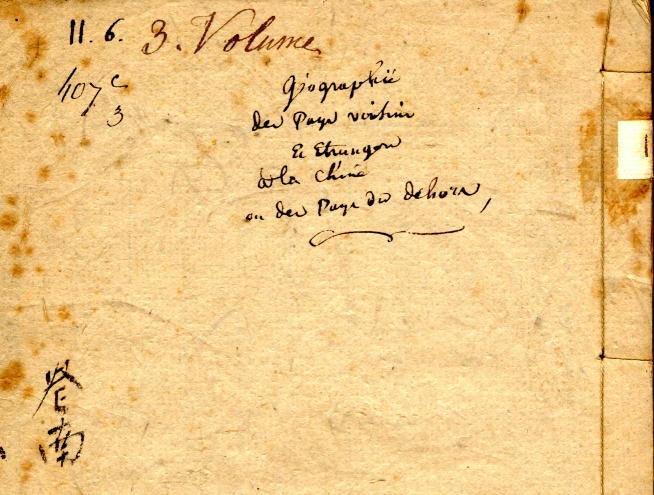 Also, during the movement to reconstitute lost works that preoccupied a number of Chinese scholars in the first half of the 19th century, a few fragments quoted in other texts were reassembled and published, notably by Ma Guohan 馬國翰 in the largest of such endeavours, his collectaneum entitled Yuhanshanfang jiyi shu 玉函山房輯遺書. 1. 六藝略: 易、詩、書、禮、樂、春秋、論語、孝經、小學 – 9 classes, 103 titles. 2. 諸子略: 儒家、道家、陰陽家、法家、名家、墨家、縱横家、雜家、農家、小說家 – 10 classes, 189 titles. 3. 詩賦略: 屈赋之属、陸赋之属、荀赋之體、雜赋、歌詩 – 5 classes, 106 titles. 4. 兵書略: 兵權謀、兵形勢、兵陰陽、兵技巧 – 4 classes, 53 titles. 5. 數術略: 天文、歷譜、五行、蓍龜、雜占、形法 – 6 classes, 190 titles. 6. 方技略: 醫經、醫學方、房中、神仙 – 4 classes, 36 titles. The earliest codification of the sibu system in its present form is attributed to the Wei 魏 Dynasty official Zheng Mo 鄭默 (AD 213–280) in his Zhongjing 中經, which was used bu Xun Xu 荀勗 (d.289) to compile his Zhongjing xinpu 中經新簿, in which all books were listed in the four-part classification jia 甲, yi 乙, bing 丙, ding 丁, corresponding to the later jing 經, zi 子, shi 史, ji 集. The present order (switching shi 史 and zi 子) was established by Li Chong 李充 (fl.320s) in his Jin Yuandi shumu 晋元帝书目 (sometimes called Jin Yuandi sibu shumu 晉元帝四部書目). All three texts cited in this paragraph are lost, and their content known only in later descriptions; only fragments of Xun Xu’s Zhongjing xinpu are preserved in Ma Guohan’s collectaneum referred to above. In the bibliographical treatise in the Suishu 隋書經籍志 (隋書, 卷32-35), compiled at imperial behest in AD 636 by Wei Zheng 魏徵, the system was given its current nomenclature, and is almost in the form in which it was to remain until the present day. The only significant difference was in the treatment of Buddhism and Taoism. These were not included in “philosophers”, but appeared in separate sections at the end with only the total number of titles given, not the names of texts. 1. 六藝經緯: 易、尚、詩、禮、樂、春秋、孝經、論語、異說、小學 – 10 classes, 627 titles. 2. 史: 正史、古史、雜史、霸史、起居注、舊事、職官、儀注、刑法、雜傳、地理、譜系、簿錄 – 13 classes, 817 titles. 3. 諸子: 儒、道、法、名、墨、從橫、雜、農、小說、兵、天文、曆數、五行、醫方 – 14 classes, 852 titles. 4. 集: 楚辭、別集、總集 – 3 classes, 554 titles. 5. 道經: 經戒、餌服、房中、符錄 – 4 classes, 377 titles (but not listed). 6. 佛經: 大乘經、小乘經、雜經、雜疑經、大乘律、小乘律、雜律、大乘論、小乘論、雜論、記 – 11 classes, 1950 titles (but not listed). The final step of incorporating Daoist and Buddhist works into the sibu 四部 system was taken in the Northern Song 北宋 Dynasty, some four centuries after the appearance of the Suishu treatise, with the completion of the Chongwen zongmu 崇文總目, which was submitted to the throne in 1042. This is catalogue of the imperial archive (called the Chongwenyuan 崇文院), and was produced by a team of scholars led by Wang Yaochen 王堯臣. The catalogue contains 3,445 titles from the early Song. The apotheosis of the system took place in the 18th century with the compilation of the catalogue of the imperial manuscript library Siku quanshu 四庫全書, which was first submitted to the throne in 1781. 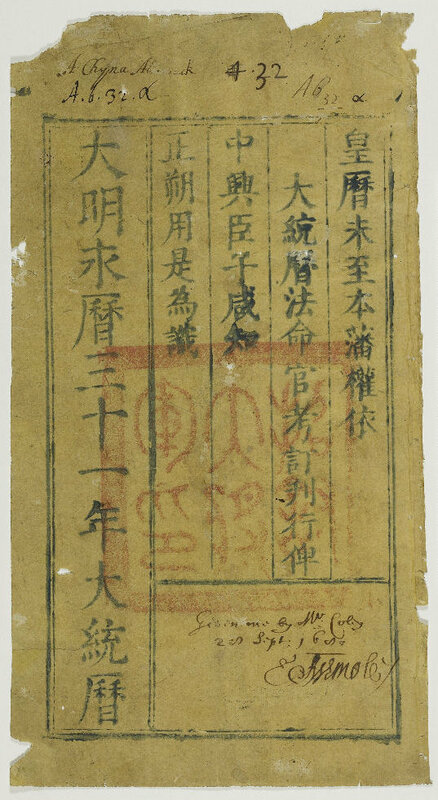 The first edition of this work was published in the imperial palace in 1789, and is entitled Qinding siku quanshu zongmu 欽定四庫全書總目 (in 200 juan), but modern editions often use the title Qinding siku quanshu zongmu tiyao 欽定四庫全書總目提要 or a shorter version of it, such as Siku tiyao 四庫提要. This is because it is a catalogue raisonné which not only lists the works, but also described their contents in some detail (these descriptions are the tiyao 提要, which means “noting the essentials”). Three official editions of the catalogue were produced during the Qing Dynasty. The palace edition of 1789, which is the best; a re-cutting of it in Hangzhou 杭州 in 1795, which is the most widely distributed; and a re-cutting of the Hangzhou edition in Canton in 1868. To these are added a number of commercial reprints, which are the editions normally found in western libraries. The four divisions now embrace 44 classes, containing not only the 3,461 titles that that were copied into the manuscript library, but a further 6,793 titles that were considered important, but not meriting inclusion (the cunmu 存目). A total of 10,294 were thus catalogued, classified, and described. But large as this figure sounds, it is less than double the number of titles in the Suishu treatise produced over a millennium earlier, and by no means represents the totality of the national literature of the time. The arrangement of the catalogue is not significantly different from that of the Chongwen shumu of seven centuries earlier. A short monograph on these calendars (based on one of the 1671 copies) was produced by Huang Dianquan 黃典權 and published in Tainan 臺南 around 1960 with the title Nanming da tongli 南明大統曆. The history of the Southern Ming period is rather complicated, and is not treated in any detail in general histories of China, or even of the Ming and Qing dynasties. So far as I know, it is the subject of only one monograph in English, Lynn Struve’s The Southern Ming, 1644-1662, published in 1984, a decade after her thesis on the subject. Why were the calendars produced? Here are the historical facts, as I understand them, insofar as they relate to the production of the calendars. As the Ming dynasty began to decline, the Manchus, who occupied the area of northeastern China that subsequently became known as Manchuria, began to move southwards, finally capturing Peking in 1644 (one month after the city had fallen to the rebel Li Zicheng 李自成) when the new Qing dynasty was proclaimed. The last Ming emperor Chongzhen 崇禎 hanged himself, but supported by groups of loyalists, some of the Ming princes held out for several decades in south China as emperors of a regime which historians know as the “Southern Ming” 南明. One of them was the Prince of Tang 唐王, Zhu Yujian 朱聿鍵, who with the support of Zheng Zhilong 鄭芝龍, set up court in Fuzhou, capital of the coastal province of Fujian, in August 1645. Zheng Zhilong was a pirate and trader who had grown rich from his activities in the Taiwan Strait and commanded considerable naval power. Under the Chongzhen emperor he had even been officially charged with coastal defence. But when the Qing armies approached Fuzhou, he accepted a bribe to change his allegiance and abandoned the Prince of Tang, who was captured and executed having reigned for little more than a year. His son Zheng Chenggong 鄭成功 however, born in Hirado in 1624 by a Japanese wife, remained loyal to the Ming, perhaps because when his father had been put in charge of coastal defence, he had been taken to China where he received a traditional Confucian education, culminating in his appointment to the Imperial Academy 國子監 in Nanking in 1644, the last year of the dynasty. During the brief period when his father was supporting the Southern Ming, the Prince of Tang had even conferred upon him the right to use the imperial surname Zhu with the title “Guoxingye” 國姓爺 (“Custodian of the National Surname”), which the Dutch subsequently Latinised to “Coxinga”, the name by which Zheng Chenggong is generally known in western literature. Against the wishes of his father, Zheng Chenggong used the family’s military and naval power to bolster the regime of another of the Ming princes, the Prince of Gui 桂王, Zhu Youlang 朱由榔. The Prince of Gui had fled to the southwest following the overthrow of the Prince of Tang, and established another Southern Ming court at Zhaoqing 肇慶 (Guangdong Province) in 1647 with the reign name Yongli 永曆. His reign survived much longer than that of the Prince of Tang, but after some initial success in driving the Qing back north, he was eventually forced to flee to Burma. The Qing pursued him, took him captive, and executed him in 1659. Throughout this time, Zheng Chenggong had been constructing a formidable power base along the Fujian coast and on the islands of Xiamen (Amoy) and Jinmen (Quemoy). With the Qing forces still in the southwest in pursuit of the Prince of Gui, he felt emboldened to sail with over 100,000 men up the Yangze river, and was only defeated when he had reached the very gates of Nanking. As the Qing armies regrouped and began to advance through Fujian province, Zheng Chenggong decided to retreat to the island of Taiwan, which at the time was held by the Dutch. He landed there in April 1661 with a force of 25,000 men, and by the following year had driven the Dutch out. But within months of consolidating his position there, he died on 23 June 1662 at the age of only thirty-seven, and was succeeded by his son Zheng Jing 鄭經, who continued to hold out against Qing occupation for almost two decades. Zheng Jing died in 1681, and power then passed briefly to his grandson Zheng Keshuang 郑克塽, who surrendered to the Qing when they finally conquered Taiwan in 1683. Although the government of Taiwan by the Zheng family was largely military, the civil apparatus of imperial government was established at least in name. The family continued to use the Yongli reign title of Prince Gui, holding the Southern Ming empire in trust, as it were, pending the arrival of better days. The production of calendars was one of the most important imperial functions in traditional China, something I have already touched on in this blog, and was used by the Southern Ming to bolster the legitimacy of the expatriate regime. The extant examples all date from the time of Zheng Jing, and are printed in indigo (lan 藍), which Frances Wood has told me was used as a sign of mourning for the passing of the Ming Dynasty on the mainland. How did the calendars get to England? The extant copies were all almost certainly obtained and brought to England by East India Company merchants; those for 1671 certainly were, and are the result of a specific donation from Zheng Jing himself, documented in The English factory in Taiwan, 1670-1685 (Taipei: National Taiwan University, 1995). At the end of May 1670, Henry Dacres (the Company’s agent in Bantam) sent Ellis Crisp with two ships, the pink Bantam and the sloop Pearl, to establish an English factory in Taiwan, in response to an invitation from Zheng Jing inviting foreign merchants to trade there. He arrived in Taiwan on 23 June. The Pearl returned to Bantam on 13 November, and the Bantam on 29 January 1671. A “Coppie list of the King of Tywan’s present to the Worshipfull Henry Dacres, Agent” dated “4th January 1670/71 anno” records the fifty “almanacks” among other things (p.79, document 12). These presents were presumably taken back on the Bantam when it sailed on 29 January. The footnote on p.79 is wrong to say that the 25th year of Yongli is equivalent to 1670. Perhaps the error is due to the fact that in 1671, the Chinese new year did not begin until 9 February, so that when Crisp was given the calendars for Dacres, it was still the 24th year of Yongli, which indeed corresponds in the main to 1670. The Chinese books that came to Europe in the 17th century, and particulary during the early part of the century, were collected mostly for their curiosity value. But by the end of the century, that was beginning to wane. The calendars, however, were almost certainly sought after because of their connection (albeit not understood) with astrology, in which several of those associated with them had an interest. Robert Boyle’s copy is one of the fifty given to Henry Dacres, and he may have received it as a director of the East India Company. But although he is regarded as one of the founders of modern chemisty, he was also an alchemist and took an interest in philosophy and theology. Elias Ashmole was definitely interested in astrology, and was given his calendar by the mathemetician and astrologer Henry Coley, a townsman who even published his own almanacs. At the beginning of this piece I mentioned a complication regarding the claim that the earliest examples of printing in Taiwan are probably to be found in English libraries. It is this. Yang Yongzhi 楊永智 (in 明清時期台南出版史, 台灣學生書局, 2007) refers to copies of the Southern Ming calendar for 1667 and 1683 as being “in the collection of the Kanda family” (“由日本神田家珍藏”, p.16). Presumably “the Kanda family” 神田家 refers to the great bibliographer Kanda Kiichirō 神田喜一郎 or his heirs. The collection of Kanda Kiichirō is now at Otani University in Kyoto, and its contents have been published (神田鬯盦博士寄贈図書目録, 1988). Unfortunately, this work makes no mention of the calendars, but they must surely exist, as Yang Yongzhi referred to them only five years ago. They would be both the earliest and the latest examples of the calendar, and I would very much like to know where they are.